Picture this: you own a nice building in San Francisco and you want to rent to some good old-fashioned salt-of-the-earth folks for not much money. I realize this is a fantasy but play along. How do you confirm the tenants you bring in are not a bunch of deadbeats? Naborly has some ideas. The startup, founded by Dylan Lenz, Zeke Kan, and Anastasia Fox from the University of British Columbia, allows landlords to create custom tenant applications that collect pertinent information from tenants. The service then creates a comprehensive dossier on the tenant, informing the landlord whether or not the tenant is a risk. They’ve raised $500,000 so far and are looking to raise $2 million in seed. The company is seeing revenue of $2,000 per day and they’re hitting about 20-50 new landlords daily. They’re also offering the services via API. They are working with credit companies right now to add more data to their system and find better ways to manage tenant ratings. They created naborly when Lenz had to deal with a professional tenant that cost him $22,000 in unpaid rent and property damage. “The tenants even threatened me at my home and work. Then when it was over I realized that there were no good tools for landlords to identify these high risk tenants and report them so other landlords know about them,” he said. The service is live now and costs $59 for a simple plan with one tenant and $149 a year for up to 5 units. 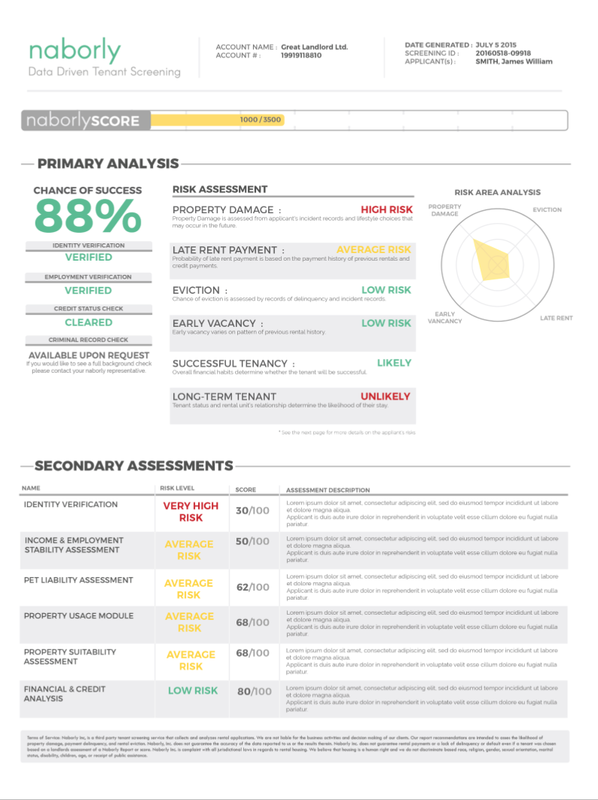 The system automatically performs credit checks and tenancy checks can can give the landlord a “score” for each tenant, ensuring that your $500 a month Mission two-bedroom goes to a solid, trustworthy, working-class family.